Saturday evening, my little one, left for paradise. For the last few days her wish had been to return to Bennett, Iowa, our hometown where our family members are buried. Now Momma has joined them in a small, country, cemetery on the low, rolling hills of Inland Township. From Momma’s resting place, you look out over peaceful fields of farmland with white houses, white barns and silos. In the coming winter the land will be bathed in a white, velvet blanket of snow and then in the spring it will change to crops of deep emerald green. If you stretch your neck, just a little and look to where the hills stop you will see the flat, rich land where my parents farmed and that was my childhood home. My mother, originally wasn’t a “farm” girl, but rather was born and raised in an Illinois railroad town. When we moved to the farm just after I was born, Momma had no idea what it meant to be a farm wife. Her first years were difficult to adapt to the new way of life, but when she did she quickly became one of the best farm wives in our community. Momma found that the farm offered her many opportunities that she may not have had if she remained in town. I will miss her greatly, as I am this moment, but I know she will now be happier in paradise. She will be able to laugh, breath, walk, run or dance. During her last few moments, as I held her, I told her that God will welcome her with open arms and then just down the path a little further, Johnny waits for her just on the other side of the “Rainbow Bridge” at the doors of Paradise. She turned her head and looked at me as she squeezed my sister’s hand. I shall never forget her little face looking up at me. Within a moments time, she left to complete the last little part of her journey accompanied by her angel. Today, at a grave service, Momma lay for a short time with the casket open. She was at home, I kissed her a final good by and then helped close and secure the top of the casket before the service began. I had chosen a new style casket for America, reminiscent of a European design. It was perfect for a stylish, little lady to rest in for eternity and surrounding her resting place was dozens and dozens of deep red roses. The service was very simple, with a priest officiating at the service. Unlike previous funerals, this time I was a part of it and as the service finished we were invited to participate as Momma was covered with the top of the vault and then lowered into the ground. The simple acts of involvement, although foreign to much of America was incredibly powerful in providing a closure allowing a feeling of peace and quietude. 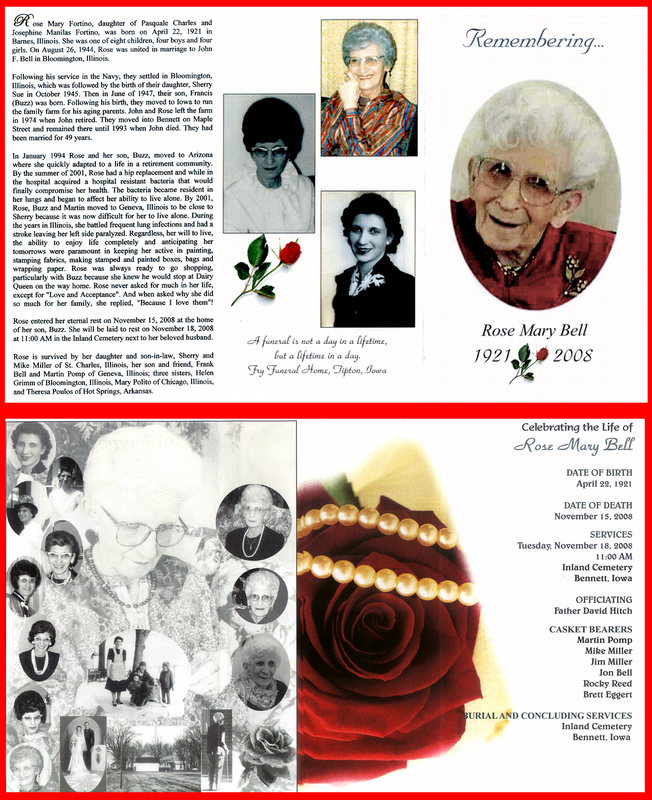 I share with you a Remembrance of Momma that was at the visitation and service. Please click on on the Remembrance. It will open in another window and you may double click to read it better. I wish to thank all of you, my friends, for the constant support and prayers you have given me during this time. You have no idea how grateful I am. Without your words of encouragement, I would not have been able to walk the final path with Momma tonight. –in the hope that tomorrow is better, if wrank, hold on to Hope. –I believe that you will have what you need to get through the worst of times, just in time. I believe it with all my heart, because I’ve experienced that kind of blessing myself. ion and the belief that she will become “Momma” once again are the cornerstones to begin building the life that will come after she is gone from this world. –I have to tell you that I think it is so special that you are still “Momma’s Boy”. That you have cared for her yourself rather than putting her into a nursing home shows the kind of character that you posses. I’m proud to be your friend, Frank, truly proud. –I pray that the melancholy spell has lifted by now.. though I know that you may always be worrying about your mother, worry is not going to make her better and it could cause you physical/emotional harm. I would place her in God’s hands, Frank — and then just ask him to give you the wisdom that you need in regard to her care as well as strength for the day. I do hope you get to see more sunshine. There are times through the worst of caring for a loved one, that one feels so numb and so robotic. That is what you need right now. Don’t force ‘thinking’ about things. It will come; all in good time. Posted on November 18, 2008 September 5, 2010 by suntithenaiPosted in alone, death, fear, thoughtsTagged cemetary, funeral, memorial. From across the miles, I am holding your hand, saying very little, just holding your hand as you say ” God, watch between you and me until we meet again.” to your mother. Frank, I am touched beyond measure that I was able to walk through this time with you. You have helped me, too, as I know that someday…someday I will walk this path, too. Your love and caring for your precious Momma is a wonderful testimony to my heart that not everyone in the world has become selfish and uncaring. It’s good to be reminded of that from time to time. I thank you. Please, let me know if I can do anything for you. I know that you know I mean this and that those are not just “words”. Dear Frank – My deepest sympathy to you and your family in the loss of your mother – what a sweet lady and a lovely remembrance. She was blessed to have you and you were blessed in kind by her. Take comfort in memories and the knowledge she is whole and happy and will one day wrap her arms around you again. Until then take the time you need to grieve and know that we here online with you love you hold you close in our prayers and our hearts and are here when you need an extra virtual hug. I do, I feel the touch of your hand and it brings with it all the unbelieveable, care, concern and wisdom you have passed on to me. I only hope I can help someone when their heart is breaking as much as you have helped mine. You, regardless, of your own pain has always taken the time to make sure I was okay, or that I could understand why something was happening. One day we must meet so that i can face you and tell you again how great of an example you have been for me. I have always questioned where you always had your strength, but you are so much like my mother that I know every cell in your body was made to be strong so that you were always ready for the worst. Our day will open and we can walk that path together so we can compare the sunshine as it crosses our faces. When it does I think we each will not only have sweet memories of our departed, but I shall remember your husband and you shall remember Momma at the same time that day. I bet, if we look forward and a little upward into the sky we will be able to see each of them smiling down on us. Oh Shadowlands, it was by chance we met. It was such a wonderful chance. Lynda, as I said to Shadowlands, we all have met by chance. A click of a mouse brought me to her, and then another click at her site brought me to you. Who knew those clicks would become an important action in our lives. I think for now I am fine. –The hope of Heaven, the joy of the anticpated reunion and the belief that she will become “Momma” once again are the cornerstones to begin building the life that will come after she is gone from this world. I think I am beginning to like virtual hugs from our little community…….they are very comforting to me. It may be strange, but often I realize I trust and listen more to everyone here. You all know me much more than anyone else; more stories and beliefs have been written and time and time again there is a closeness and caring in the responses that we often lack in real life. You, Linda, have the unique ability to make me smile, even today as I read, because when I read you writing it makes me feel good and I smile. Thank you much, and yes Linda, I know you and the others are not far away. Its a very, very nice feeling. I don’t believe in “chance” rather I believe in “Design”…I do believe that it was by God’s design that all things were created and that includes your click of the mouse…God was clearing a path to all of us who found you so talented and fascinating. Just as I know that, in the midst of this pain, I am being further “designed” and prepared to live this life and the next one to a deeper and more satisfying degree….